K to12 in Relation to Arts and Animation | Miracle Animation Studios Inc. The Philippines will convert into a new system of education for high school by 2016. Instead of 4 years in high school (also called Grade 7 to Grade 10, first year to fourth year) an additional 2 years will be added called Grade 11 and Grade 12. DepEd is the government agency involved in the preparation and implementation of this major change in basic education since its announcement in 2010. To know the reasons behind the K to 12, just search for the Philippine Daily Inquirer article: DepED to announce K to 12 program Tuesday by Tarra Quismundo on 10/5/10. 3) CHED – For the adjustment curriculum for colleges. The first and second year college level will now fall under K+12. 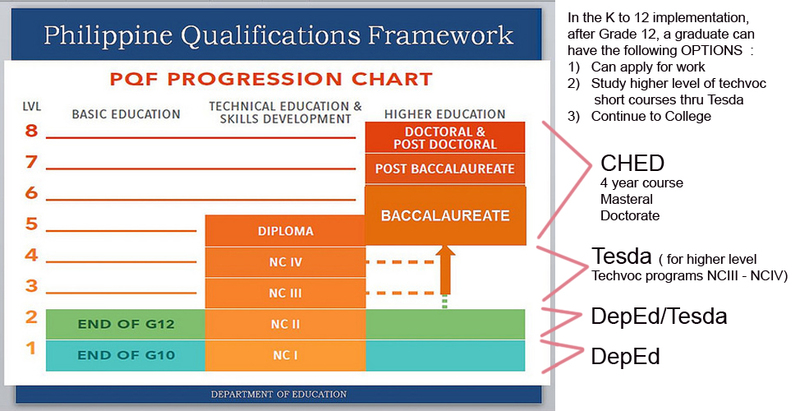 The progression of education and the government education agencies working together in their diploma and certification. 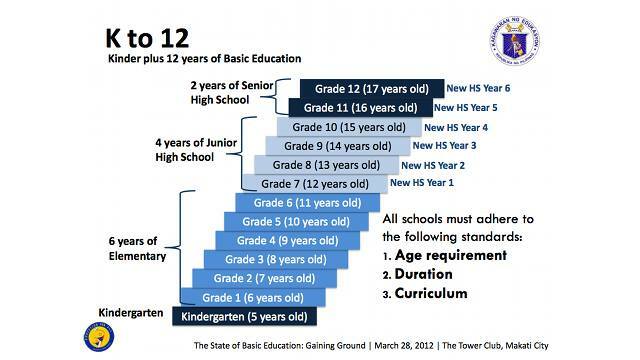 The K to 12 chart shows the mandatory age requirement and duration from kindergarten to Grade 12. Since I am involved in the Arts and Animation areas of education, I would only focus on these areas. 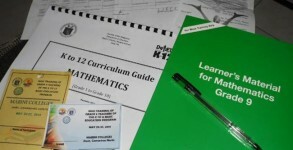 All other details of K to 12 curriculum and core subjects are downloadable at the DepEd website. Adding two years for high school requires additional teachers to teach the Grade 11 and Grade 12 programs. The tracks to choose from are: Academics, sports, arts & design and technical vocational livelihood. Each of these track needs a specialized teacher. Many high school teachers are not certified to teach these additional subjects. So the school either upgrades the skills of their teachers or they should hire instructors who could handle these tracks. 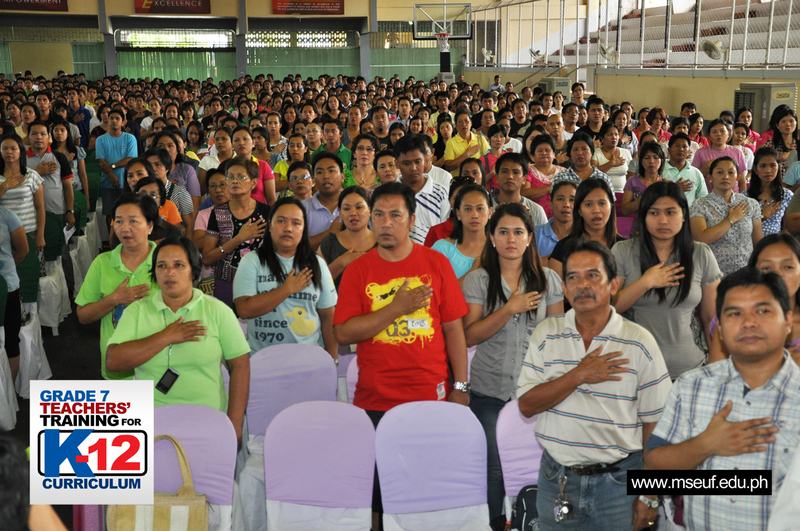 A teacher should have a National Certificate (NC) given by TESDA to teach skill based or Techvoc tracks. Having the National TVET Trainers Certificate (NTTC) from TESDA is a plus. See Animation Council of the Philippines and TESDA article in this blog to understand the NC and NTTC better. a) Arts & design – covers traditional arts & principles, graphics & design. b) Technical Vocational – under ICT : Technical drafting NC II, Illustration NC II and Animation NC II. 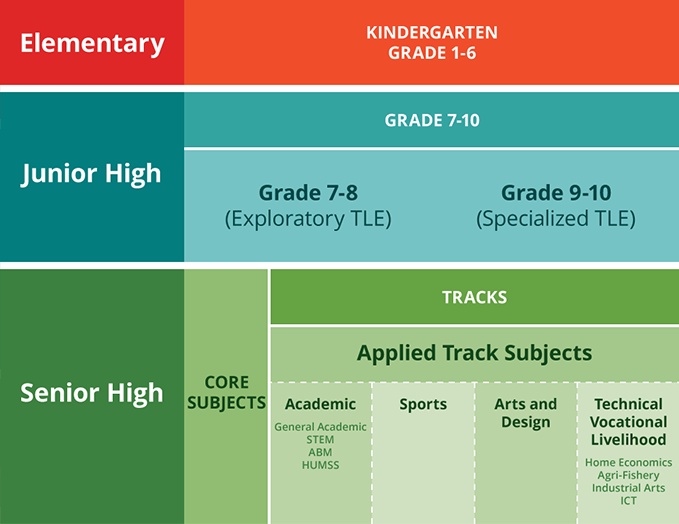 Students will have to distinguish and choose which track to go into for the last two years that will fit their skills. The schools whether public or private should have expanded their facilities to be able to offer the additional 2 years. If they have no additional facilities, the school should have partner institutions or vocational schools that can accommodate the tracks chosen by their students. If the teachers already have the skills to teach any of the arts, design, animation, illustration and technical drafting subjects, its time to get the NC of the track they want to specialize to teach. They have to reserve and call an accredited assessment center to be scheduled for a one day assessment exam. Details of the procedure – just go to the article Animation Council of the Philippines and TESDA in this blog. 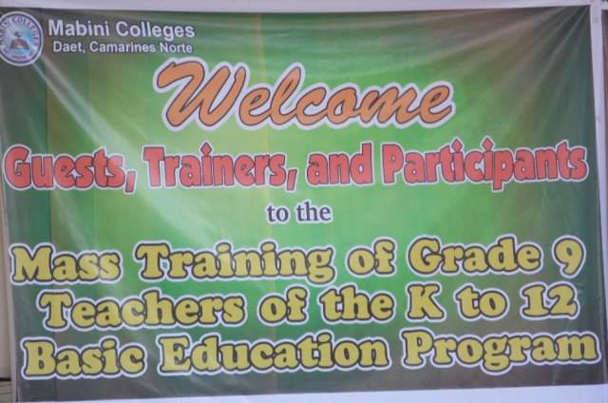 For public, private or vocational schools who wants to partner with schools offering K to 12 programs and has the facilities and the instructor credentials to teach the tracks; they have to register at DepEd to be an accredited institution. Procedures and documentations to submit are at the DepEd website. Deadline is set on August 15, 2015, unless the DepEd announces an extension. There is also a partial list of schools and vocational centers that were already accredited by DepED in the website. More schools and Techvoc centers are lined up and still being processed by the DepEd at the moment. Is the Philippines Ready for K to 12 by 2016? There are a lot of news, talks and rallies about the readiness of the country to adopt the K to 12 plan. Some say the DepEd is not ready for a nationwide change for the educational system because the DepED lacks the budget, teachers and facilities. Others say, more students will not be able to finish high school due to poverty and that we need to improve the quality of education rather than add two more years of basic education. It will certainly take time to learn and adapt to the new educational system, but our country needs it as we are the only country with 10 years of basic education. Since its 2010 announcement, the DepEd has been holding continuous seminars, workshops, massive trainings for teachers, distributing learning kits nationwide. 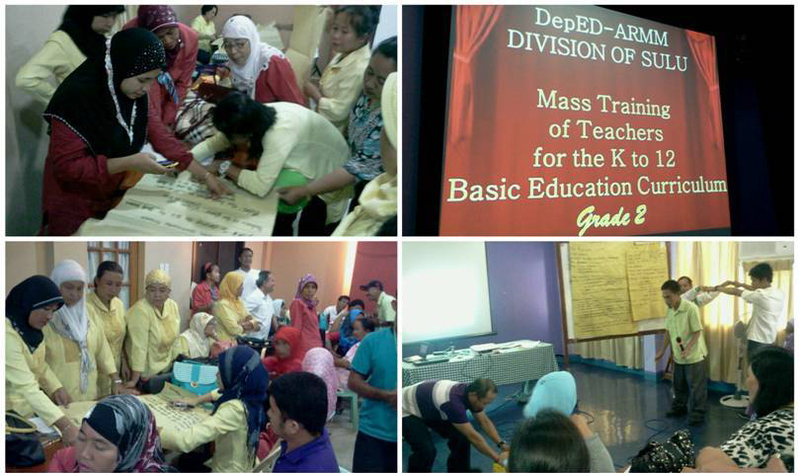 Since 2011, there is also a Schematic Implementation Plan of K to 12 that is being followed by DepEd. The plan will run until 2024. 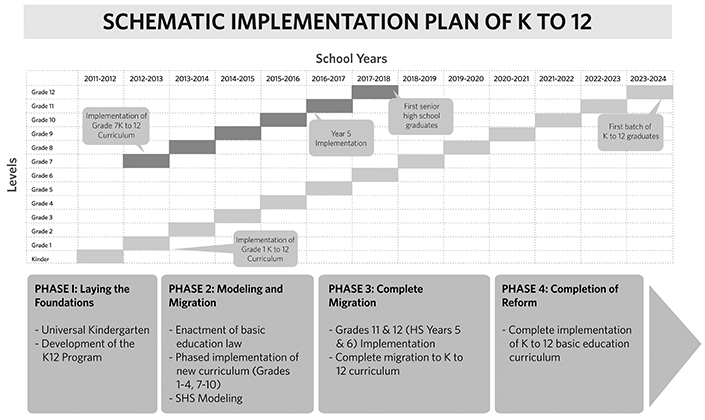 The plan has 4 phases and covers certain areas of the K to 12 program. If you want to more facts about K to 12, just see Busted 12 Myths about K to 12 at Tumblr. 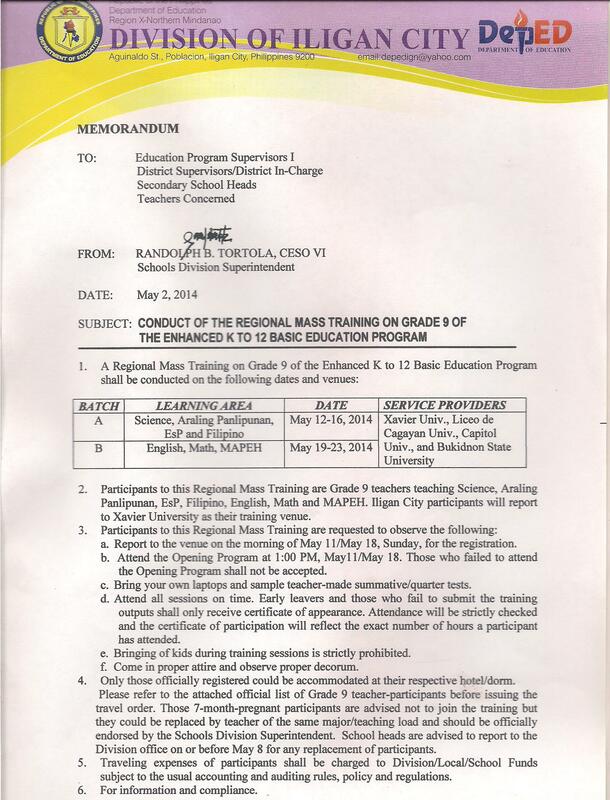 Hi this is a great news about the K-12 program and the partnership it has with TESDA. This is great opportunity for all students to developed new technical and vocational skills.